Jonny Blair of Don't Stop Living, Best Travel Blogger in the World? There maybe better bloggers, there maybe better travellers but at both Jonny Blair is flawless and combined he is unstoppable. Jonny Blair is quite possibly the best travel blogger in the world. While I can only name a handful of Travel Bloggers I just don’t see how it is possible to be better. For the past couple of months Jonny Blair has been travelling through Iran and Iraq yet his blog churns out twice as many posts as mine can ever find possible. To me it’s bewildering. As far as blogging goes he’s a machine and as a traveller he’s now covered 85 countries through all 7 continents in surprising depth and detail. He has been away from his hometown for over 10 years, constantly off the beaten track and to fund his travels Jonny Blair has worked 53 jobs in 23 cities, towns and remote farms. This is why I say he is the Best Travel Blogger in the World. To me his travels are slightly unbelievable but yes they are all very real and well documented on his blog Don’t Stop Living and his endless reel of YouTube videos. Being both from the same country, hometown and even grammar school we have become chums through blogging and we recently caught up for beer and banter in Bangkok. Seeing his blogging first hand, his diary of endless to-do posts and different passwords going for every website and social media he had joined – I was a little blown away by his organisation and focus. Anyway, now while he appears to be at his busiest I thought it would be a good time to pester him for an interview (he answers back in less than 12 hours…). You were recently in North Korea for the world games and I was surprised how you made the place look normal. You seemingly sidestepped the regime to go beering in bars, travel the subway and uncover local life which few knew existed. Did you find there to be much contrast when travelling in North Korea to say neighbouring China, if so what are the restrictions and were there any barriers you dared to hurdle? First up – I love BOTH North Korea and China. They are pure backpacking gems and from my point of view the only real difference is the cost of going there as a traveller – China is easy and cheap. North Korea continues to be through a guided tour. But leave all your pre-conceptions behind. I played pool and drank beer with North Koreans. I rode on the Metro and I sipped a beer by the “oh so dangerous” (allegedly) North Korea to South Korea border. People try to tell you all this garbage about “but you’re only seeing the rich people, they hide all the poor people”. I don’t believe all that for a second. The people of North Korea are proud of their leader and their regime. It’s one of the longest lasting true communist regimes – you still don’t see any adverts. But shock horror – they’ve all heard of Facebook, they all know who David Beckham is and Kim Jong Il owned a MacBook Pro. IN terms of barriers – of course the language is a problem in China – especially on some off the wall spots like Luoping, Likeng and Taxia. I’m lucky I have my girlfriend to help me by in those parts. The rest of the time – you just have to get on with it. In terms of restrictions – I was offline the entire time I was in North Korea – I didn’t have internet or a phone so this meant scheduling all my posts in advance. I loved the freedom of that though – something which some un-educated people might find ironic – yes I enjoyed the freedom of North Korea! Also in terms of photo restrictions I found there aren’t really any bad ones – just don’t take photos of soldiers or at mausloeums (a given in every country surely?!). You travelled to Antarctica which for most travellers is a dream destination but it also a very expensive dream. How did you manage this as a backpacker? For the past few months you have travelled through some of the least known to travel and many of the most dangerous countries of the world. Share with us some of the highlights? It’s pretty tough sharing highlights when every day contains so many. I’d say sharing a Lada ride with NINE passengers on the bumpiest ever mountain dirt tracks of northern Azerbaijan is up there. It was a crazy journey from Xinaliq to Quba and we were glad to get through it! I also got interviewed on Sky Sports in the main square in Baku while watching a World Cup Qualifier between Azerbaijan and Northern Ireland. Iran was just awesome – especially camel riding in the desert, staying in remote towns and villages and getting the best hospitality ever from Iranians. The Iranian people are by far and away the friendliest you will EVER meet. I guarantee it. I also did a guided tour of Palestine’s unventured parts which was a real eye opener. Just a few days before we headed there, an Israeli policeman was shot by a Palestinian sniper. We saw the ceasefire lines and got to meet people on both sides. 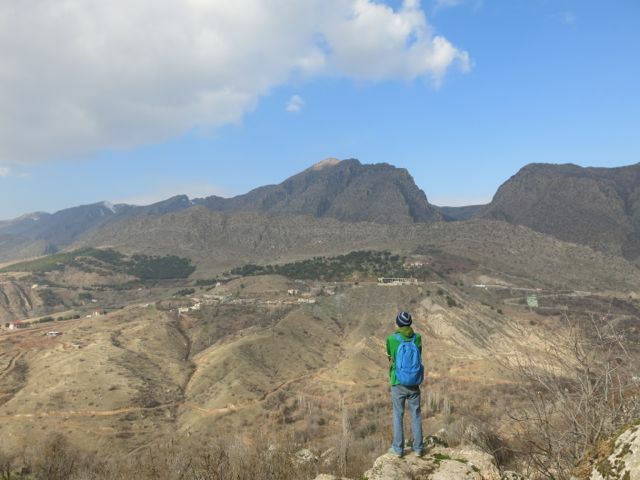 Recently I’ve just been to the mountain village of Amadiya which is in Iraq – the Kurdistan part. It was just amazing – beautiful views, friendly people and no tourists about. We had the place to ourselves and savored the views. Travelling continuously over the past God knows how many months must have taken a hell of a budget? I know your a magician at budget travel and will have done it unbelievably cheap so what was your budget over this period and what’s your trick for keeping travel costs low? A combination of things help me budget. I hate luxuries. I’ve never paid more than $100 for a single item in a shop (laptop excepted). I’ve never bought a bed, a TV, a wardrobe or a fridge. I rarely stay in posh hotels. I love staying in hostels – I sometimes stay multiple nights to get discount. I drink beers in Happy Hour when I can. I buy cheap supermarket food that can be eaten on the move. I never buy bottled water. I just refill my bottles. I don’t book tours unless it’s the only way to get somewhere. I don’t buy things for other people (read: a tad selfish). I work in multiple jobs. I haven’t signed a rent contract for a flat in almost 6 years. I’ll sleep anywhere. I rarely buy new clothes. When I check flights I just book the one that is cheapest within a one week period. You’re covering countries quick and fast right now, have you set yourself a target to complete the globe and what will you do when you have? No real targets in stone as you never know where life will take you – I might want to stay somewhere longer. But by the end of 2014 I’d love to be on the 100 country mark and I know I can do it. I’ve been to 85 countries now, so another 15 new ones and I’m there. By the time I turn 40 I’d like to have seen every country in the world. I am writing this interview from the central Starbucks in Xian, China at 07.30am. Travelling with my partner means tiptoeing around until she wakes (9 I hope). I also like afternoon ‘Siestas’ when Fanfan is desperate to explore. Is this something you can relate to travelling with your better half Panny? Do you find opposing routines, ideas or interests when travelling? Who decides the next destination? We both decide the destinations. She chose Turkey, I chose Iraq. We both opted for Iran. She chose Georgia, I chose Azerbaijan, we both agreed on Armenia. Most of the time when the word “travel” is mentioned, I don’t care where we’re going! You have been considering recently a move to Bangkok, a city which you tell every traveller to avoid. I do agree the city can be a pain on short visits but what is it that appeals for longer stays? You have everything you want in Bangkok except your family. There are cuisines from all around the world. There are temples, churches, rivers, mountains, shopping centres, tigers, bars etc. Plus there are a load of “ex-pats” to hang out with if you get bored of the local people. Plus it’s cheap. If you’re earning your money online in US Dollars, Bangkok is a cheap place to live. I haven’t decided on it yet – but might do in the next few months. You also have a website about the travelling Northern Ireland flag. Has the flag covered the same countries as yourself or have you to retrace your steps. Yes – it’s been there the whole time – but not always the exact same flag. My family will tell you of my teenage holidays when I carried my Northern Ireland flag with me. I’ve always been proud of doing that. And while it’s a disputed flag or region, I just see it as a bit of patriotism and pride. I’m proud to have grown up in Northern Ireland. The same country that has produced the likes of George Best, CS Lewis, Rory McIlroy and Van Morrison. The website travelling Northern Ireland flag was the one that got me the BBC interview, not my travel blog! After years blogging as a hobby you recently made travel blogging into a profession. In doing so you went from obscurity to winning a ‘Best Newcomer’ award in 2013; quite strange considering you have been blogging continuously for the past 7 years. What are the main steps you took to become a professional blogger and how can others do the same? I bought my own domain, I made it look more professional and I changed the wording style of the posts to be always about the reader. Plus I became a lot more known in the travel blogging industry by emailing other bloggers, writing articles for them and doing a load of guest interviews. Working hard is the only answer. Work hard, be nice and live your dream. Anyone can travel and anyone can blog. Put the two together and you have the makings of a new career! Happy New Year. Your 2013 has been seriously impressive. Is 2014 going to be better? What’s the plans so far? I’m in Iraq as we speak!! After Iraq I’ve plans to head back to Asia and do a bit of work. By June I aim to be in Brazil and I also want to head back to Northern Ireland at some point to say hello to my friends and family. It might be tough to squeeze the 100 countries in, but I’ll do my best! Great interview, Lads! Jonny, you may want to look into some Central American and Caribbean nations while you are in Brazil for World Cup – time permitting, of course. It’s really an underdeveloped and cheap Region of the World to explore due to a lack of tourism infrastructure in most places (except Costa Rica). But, it definitely holds a lot of culture, history, and adventure for those with an open mind. This is largely due in part to many of the Civil Wars that occurred in the area around the 80s/early 90s, and the preconceived notion by American media that they are still “dangerous.” However, I don’t find that to be the case as long as you take the normal precautions that you would anywhere else. I thoroughly enjoyed Belize and Cuba personally, and have had friends who have raved about Guatemala, Nicaragua, and Honduras of all places. Anyways, you could easily add to your list of new destinations in Central America and the Caribbean if you have the time later this year. Looking forward to hearing more of your 2014 travel stories!